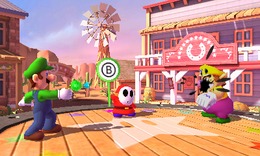 Shy Guy Showdown is a duel minigame found in the game Mario Party 5, and returns in Mario Party: The Top 100. The object of this minigame is to be the first to shoot the ink ball at the opponent. A Shy Guy in the middle of the arena raises a sign, and the player must press the button shown on the sign before his or her opponent to win. Sometimes the Shy Guy raises a fake sign (i.e. a "!" sign, "M" sign or skip sign). The player shouldn't do anything in this case or else the ink ball explodes inside the gun, staining the player and making him or her lose. If the player presses the wrong button on a legitimate sign or if the player presses any button too early, the same result happens. The setting in this minigame is commonly used for simple Duel minigames. It takes place on a western-themed town. 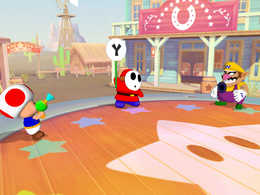 The characters (and the Shy Guy) are standing on an arena, which is surrounded by small houses or buildings. Press whichever button appears on the Shy Guy's sign. Rules – "Press the button on the sign that the Shy Guy holds up. Whoever presses the correct button first wins." Advice – "The Shy Guy might hold up a fake sign. Don't let him fool you!" Description – "Be the first to press the button the Shy Guy shows! You only get one chance!" On-screen – "Press the button Shy Guy shows!" Hayauchi ganman! Quick Shot Gunman! The fake sign that the Shy Guy holds up has the letter "M" usually found on third-party controllers produced during the GameCube's lifespan. Said letter stands for "Macro" and usually allowed for programmable inputs. This page was last edited on December 30, 2017, at 00:56.